Alternative Wildlife Solutions, an AnimalKind accredited company, rescued her from the chimney and brought her directly to Wild ARC for care. 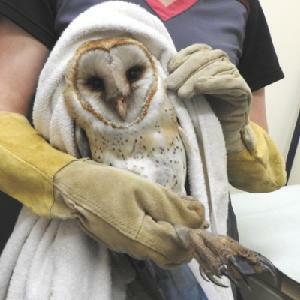 She was severely dehydrated and absolutely covered in soot, including in her eyes and mouth. There was so much soot in her eyes that her nictitating membrane (a second set of eyelids that help protect the eyes) was protruding and unable to retract. Additionally, the course material irritated her eyes so severely she has ulcers covering about 75% of her eyes. She was very stressed out when admitted and needed to be put on oxygen. Her mouth and eyes were flushed to remove the soot and she was provided with a lubricating gel to help her injured eyes. She will need a bath to remove the soot from her feathers but her hydration level is so poor that the bath will have to wait until she is more stable. She will need to be in care for quite some time while her condition stabilizes and the ulcers on her eyes heal. Injuries like this can be easily prevented! If you have a fireplace, the next time you have your chimneys cleaned please ask about protective covers that prevent wildlife from entering. Birds and mammals often think chimneys are a great space to find shelter or to raise their young. Prevention is key to excluding animals from unwanted spaces like chimneys. You can help us ensure this beautiful barn owl returns to the wild by providing a donation towards her care. Thank you for your support.